The coyote is a predator, with a decidedly negative reputation among farmers and ranchers. Yet its presence in West Marin is undeniable. We have spent many nights on the ranch listening nervously to the welps of coyotes in the hills. Five years ago I stumbled on the work of local artist Julia Lucey in a small art shop in Fairfax. 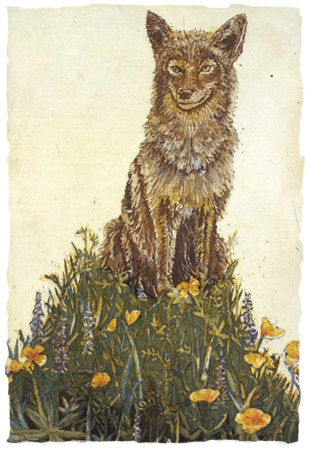 With painstaking detail she renders the wildlife and botanicals of West Marin in copper, using a traditional artform called “aquatint etching.” When I saw her piece titled “Spring Coyote” I fell in love. Somehow it captured everything about this place. The splendor of wildflower season brought on by winter rains, coupled with the beauty (yes, beauty!) of one of our most interesting and intelligent predators. Julia was kind enough to give us permission to use her beautiful art as the basis for creating an identity for the ranch. At our request she created a second piece, exposing more of the coyote’s true nature. In this piece, he is scheming and hungry! Being a farmer of lambs, I can think of nothing more ominous than a “hungry coyote” licking his lips over my flock. We go to great lengths using non-lethal predator control to prevent the coyotes from harming our livestock. But we respect these creatures and recognize they are an important part of the ecosystem that surrounds us. Julias’s art and her passion for creation have been a continuous source of inspiration for us and how we present the ranch and our products. We are blessed to know her and support her work. For more information on Julia, or to investigate her amazing body of work, please visit http://www.julialucey.com.